Let me first say that I am a Baring-Gould fan. If Baring –Gould said this is where Sherlock Holmes was or this is what Sherlock Holmes did, then it must be gospel. That is, until I read Don Libey’s “The Biography and Autobiography of Sherlock Holmes”. Mr. Libey provides us with a wonderful alternative to Baring-Gould that is rich in its details of the life of the great detective. The book is a combination of the biography of Sherlock Holmes as written by his brother, Mycroft and an autobiography by Sherlock himself subsequent to Watson’s death in the 1920’s. 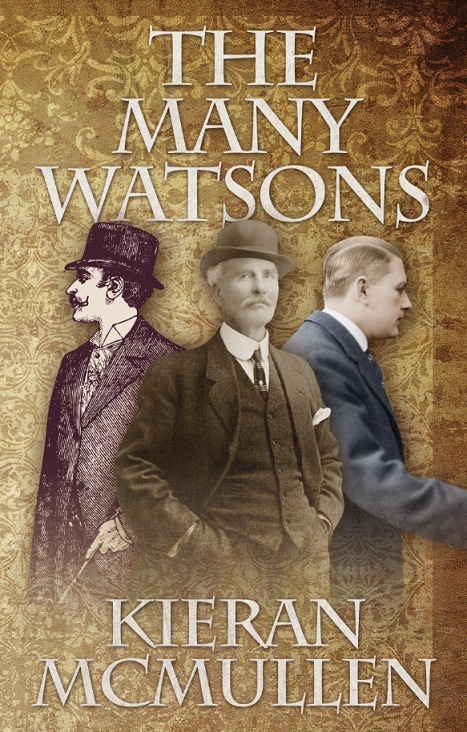 While a biography of Holmes, the book does not leave out Mycroft, Watson or the Holmes family. Libey fills us in on the true history of the Holmes family; where they were from, where they got their wealth and how they related to each other. I especially appreciated Mycroft’s explination of how it took all three of our main players to see a situation through: The feeling Watson, the mental giant Mycroft and the synthesis of the two, the human and deductive Sherlock. Another interesting aspect was Sherlock’s statement that he had written a monograph on the ability to determine the breed and age of a horse by the hoofmarks as well as identify the farrier by the tool marks on the horseshoe. Having been a horseshoer for over 20 years now I can well attest to the later, each shoer works differently with his tools. But to tell breed and age is remarkable. I must find a copy of this monograph. I have no doubt that if anyone can perform this feat it is Sherlock. This is an absolutely wonderful book and is well worth the price to add to your Sherlock Holmes collection. I very highly recommend it. The book is not only filled with interesting information, it is well written and flows easily. It is a great read. 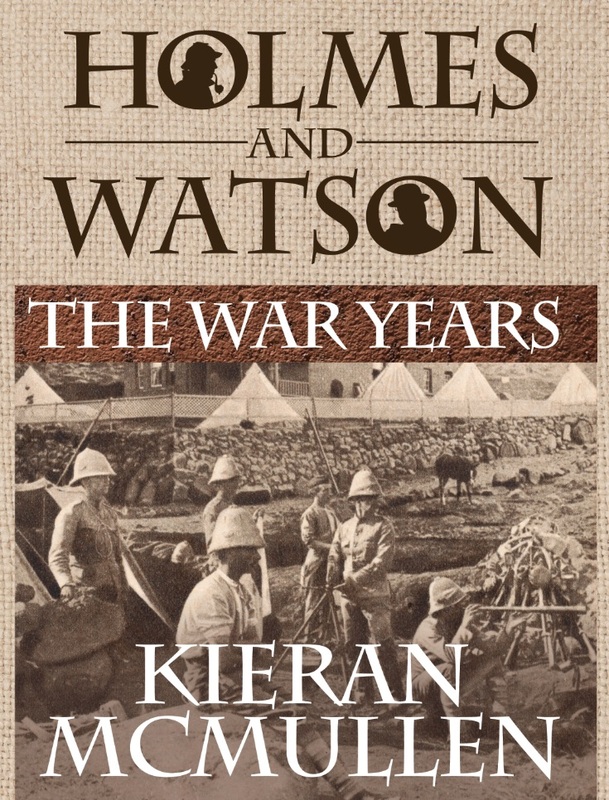 Holmes and Watson: The War Years….a review. It was the time of Queen Victoria’s “Little Wars” and the “War to End All Wars”. 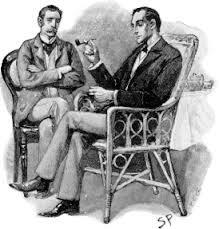 It was also the time of Sherlock Holmes and Dr John Watson. 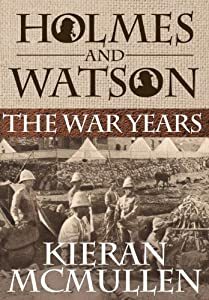 Watson, the man, would be formed by his experiences in the British “Second Afghan War”, before he ever met Sherlock Holmes in an adventure, he would record this experience as Watson’s Afghan Adventure, a tale of war and mystery. Later, Holmes and Watson would go on to not only share the problems of crime solving, Watson’s three marriages, a purported tragedy at Reichenbach, and Holmes’s return from the dead; they would also share two more wartime experiences. 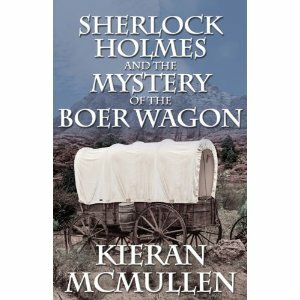 In Sherlock Holmes and the Mystery of the Boer Wagon, they are called on by Mycroft Holmes and the British government to go to the battleground of South Africa. Their mission is to stop the flow of army secrets to the Boers and try to recover a King’s ransom in gold. By the time of their third great wartime adventure the two friends are retired, but Mycroft, and the government, need them once more as they are called on in Sherlock Holmes and the Irish Rebels. Holmes and Watson had already foiled the plans of a German espionage ring at the start of the Great War in the tale Watson called “His Last Bow.” But it was not, in reality, Holmes’s last bow. Holmes and Watson are sent now to the little war within a war, the killing fields of Dublin in 1916 and the Irish Rebellion. Can they stop it? And can they stop the plans of a renegade member of the Dublin Metropolitan Police? . A special hardback edition including all three bestselling Sherlock Holmes novels from Kieran McMullen. This hardback edition of Kieran McMullen’s three Holmes novels looks very handsome indeed and the content no less so. The author is an ex-Army man and this shows itself in the details of Army life which we can be confident has been checked and double checked. These details however do not in any way overshadow the action or get in the way of a good story (which these are). Watson’s Afghan Adventure fills in all the details of Watson’s campaign in Afghanistan and gives us the Doctor Watson that we know….courageous, loyal and far from stupid. It is at time harrowing although not without humour and the author paints a very vivid picture of camp life with an array of characters all finely drawn. ‘The Mystery of the Boer Wagon’ is my own particular favourite. A tale with Holmes, Watson and Conan Doyle acting together to seek out a leak of military information and a no small matter or recovering stolen gold. A rollicking adventure, it fairly rattles along and introduces us to some great characters along the way including a young, very young Basil Rathbone! A hugely enjoyable read which amply rewards the time spent in reading it. Highly recommended. ‘Sherlock Holmes and the Irish Rebels’ is a different kettle of fish. The mood is downbeat, although no less exciting than the previous two novels. This is 1916 and the time of the Easter uprising in Ireland and Holmes and Watson find themselves catapulted into the action. One gets the impression that neither man had any stomach for what they have been asked to do. It was a desperately sad time for all concerned and it is impossible to stand outside the GPO in Dublin and not think of the cruel fate in store for the ringleaders. Not England’s finest hour and we get the mood of this from the final chapter. Not an easy read then, but a very good one. 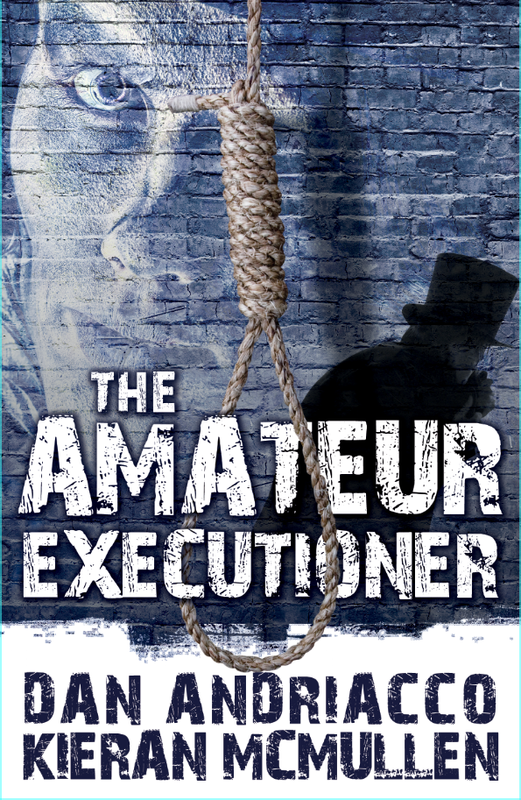 The Amateur Executioner is available from all good bookstores including in the USA Amazon, Barnes and Noble, in the UK Amazon, Waterstones, and for everywhere else Book Depository who offer free worldwide delivery. In ebook format there is Kindle, iPad and Kobo. “I’m up to chapter 18 and enjoying it immensely. I like the way that the real-life characters have been introduced into the plot. It seems natural and not forced.” That’s what a prominent member of the Sherlock Holmes Society of London says about THE AMATEUR EXECUTIONER at more than halfway through the book. “This is Mr. McMullen’s second book of Sherlockian fiction and his gift for catching the reality of time and place is undiminished. Since this book is about Irish History, it is a sad book. It tells of the Easter Uprising of 1916 as experienced by Sherlock Holmes and Dr. Watson at the request of Mycroft Holmes. The characters are mostly historic and are presented much as they were, flawed human beings trying to live up to their own ideals. My knowledge of 20th Century Irish History is spotty at best, so I cannot speak to the accuracy of Mr. McMullen’s portrayals, but I suspect they are fairly true to life. Many of the participants in this tale died during or within a short time after the events narrated. Most of the prominent survivors died within the next few years, so our knowledge of these times relies mostly on the memories of a very few survivors and on those of friends of the participants. Paper evidence, outside of court records, is in short supply and the courts were mostly English, with little regard for the truth of events in Ireland in the face of the urgency of The Great War. The History between England and Ireland begins shortly after the Norman Conquest. From the traditional English point of view, Ireland was a land of feuding tribes and pirate raiders. The period of anarchy that followed the death of Brian Boru, who turned back the Vikings and their allies at the Battle of Clontarf, offered all the excuse that the Norman overlords needed to extend their conquest to the island. Unlike England, the Irish were never integrated into the Kingdom. They retained their own language, customs and religious leadership. When Henry split the English Church from Rome, the Irish remained in communion with Rome. The Church of Ireland made little impact on the Irish. Most members were those whose loyalties were to England such as the descendants of Scottish and English emigrants brought into Ireland as part of Royal policies. The Glorious Revolution of the Seventeenth Century completed the entire subjection of Ireland to English control as Cromwell invaded and devastated Ireland. Revolution festered and generations of Irish patriots carried out an uprising roughly every forty years from the late Eighteenth Century into the Twentieth. This story is typical of Irish tragedies. Poets, teachers and madmen persuade and trick others into a hopeless revolution and the English act in their chosen character. After the battle is won, they decide to wash out all traces of revolution with blood after being unable to mount any effective prevention. Stupidity, venality and complete misunderstanding of the other side mark the normal course of English-Irish relations. Sherlock Holmes and The Irish Rebels is available from all good bookstores worldwide including in the USA Amazon and Barnes and Noble, in the UK Amazon and Waterstones – and in all electronic formats including Amazon Kindle, Nook, Kobo and Apple iBooks (iPad/iPhone). It’s 1920 and Holmes is still an active player on the stage of life but this time he has competition. Enoch Hale, a Great War veteran and reporter for an American news syndicate lives and works in London. Hale is on the track of a killer and a mix of the nobility and the dregs of society are involved. Will Holmes help or hinder Hale as he tries to sort out fact from fiction? Will Hale be able to resist the tugs of a beautiful woman who may be involved in the mystery more than he wants to admit to himself? Will another Holmes stand in the way of both Sherlock and Enoch?